can improve daily life, identify a challenge, and then design a product or solution. This in-depth collaboration includes bus funding for a field trip to see the exhibition; funds for classroom materials; and a culminating student symposium on March 6, 2019. During the symposium, students will share their designs, be inspired by one another, meet professional designers, and have their work critiqued and recognized. 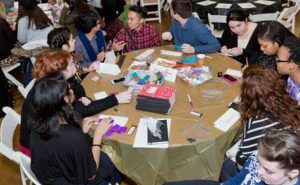 FashioNext is the Museum’s ground-breaking competition for aspiring teen designers. Teams from local schools and community organizations participate in the three-month competition. Their challenge: create a garment inspired by the Museum’s world-renowned costume collection. Learn more. CHM is a proud participant in the Park Voyagers program. The program creates a unique opportunity to bring Chicago children and city museums together. Learn more.